Do you ever wonder if you are using the right sewing machine needle? Ever get confused by all those different numbers? Wonder why your machine is skipping stitches (it could be your needle!)? I learned to sew clothing first, at around age 11, from my mom, who learned from her mom, who learned…you get the picture. When I have a question, I just check with Mom. My friend, “soon-t0-be-blogging” Toni, never learned to sew until she decided she wanted to be a quilter in her mid-twenties. She dove right in, bought a mid-price Husqvarna/Viking, started building an amazing stash (which is willed to me, should she go first…mine is willed to her as well…we are not morbid, just pragmatic…do you want your hubby or children to send your beloved stash to the local landfill?!? ), and she signed up for classes at her local quilt shop. She’s a great quilter, less prolific since her son came along two years ago, but still pieces and appliques wonderful quilts. The size of the sewing machine needle is in direct correlation with the weight or thickness of the fabric you are sewing. Needle sizes are numbered using both European and American systems. Some companies label their needles with both systems, so your apt to see a 60/8 or 120/19 on a package. In both systems, the higher the number, the thicker the needle, and the larger hole it will make in the fabric. Needles are available in UNIVERSAL, SHARP, and BALLPOINT tips. The needles are designed for different types of fabrics. Your fabric may require a specific point type to obtain uniform stitching from your sewing machine. Universal-point needles can be used for sewing both knit and woven fabrics. Sharp needles are designed for woven fabrics. 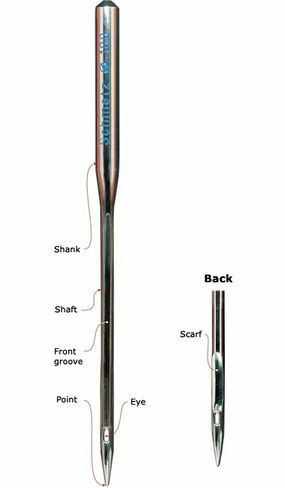 Ballpoint needles are designed or knit fabrics. Here is another reference I found, lots of GREAT information, maybe more than you ever wanted to know about your sewing machine and it’s little needle, but information is power, am I right!?! I almost always use a 70/10 Sharp when pieceing a quilt top. When paper piecing I go a little larger because it perforates the paper with a larger hole, and thereby makes quicker work of removing the paper or foundation. Obviously, there are other specialty needles to consider, like Topstitching and Embroidery needles (use these with your metallic or thicker threads when quilting! ), Stretch needles for sewing stretchy fabrics like t-shirt knits, etc., Wing Needles can be used with decoartive heirloom stitches, Denim needles, Double needles for sewing parallel lines (I’ve never used these myself), Quilting needles for use when sewing through top, batting and backing, and so on. Using the right tool for the job makes every project go more smoothly. Great idea to post this info. I have a laminated piece by my machine that I still refer back to. great post. i’m bookmarking this to refer to. Oh my goodness, oh my goodness! I love this post! !